When it comes to hearing aid styles, there are many options from which to choose. From the tiniest custom made product to the most powerful standard hearing aid, we have it all for every type of hearing loss. Custom hearing aids are made from a mold of your ear and contain all of the components of the hearing aid in a custom-fit, hard-molded plastic shell. These types of hearing aids can be a comfortable solution that is discreet as you want it to be. In-the-Ear (ITE) – For mild to severe hearing losses. When most people think about hearing aids, the first thing that comes to mind is an In-the-Ear, or ITE, hearing aid. An ITE (full-shell) hearing aid is custom made and fills most of the bowl-shaped area of the outer ear. Generally, this style is helpful for people with mild to severe hearing loss and offers the most fitting flexibility available in custom hearing aids. 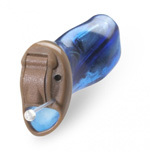 ITE hearing aids are the biggest of the custom hearing aid products. As such, they are very visible in the ear. They may also pick up more wind noise than smaller products. The size of an ITE hearing aid also offers greater feature selection. These features include volume controls, program buttons and directional microphones. 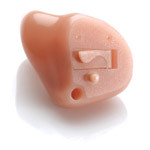 ITE hearing aids are also easier to insert and remove for those who have arthritis or other dexterity issues. The batteries are larger and are also easier to manipulate. In-the-Canal (ITC) – For mild to moderately-severe hearing losses. An In-the-Canal (ITC) hearing aid is also custom molded, but it only fills a small portion of the bowl-shaped area of the outer ear, leaving the majority of the ear open. Because they are smaller than an ITE, ITC hearing aids have a narrower fitting range. They can improve mild to moderate hearing loss in adults. ITC hearing aids are less visible in the ear than ITE hearing aids. Because the profile is smaller, they are less easily manipulated by patients who have arthritis or other dexterity issues. They do not have the ability to produce as much amplification because they cannot accommodate larger receivers. Also, ITC hearing aids may not fit well in smaller ears. ITC hearing aids are still large enough to accommodate some of the more popular features of an ITE. Generally, these can include directional microphones and a push button or volume control. 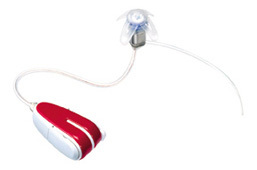 These hearing aids usually use mid-sized batteries and are easier to use with a telephone. Completely-in-the-Canal (CIC) – For mild to moderate hearing losses. Completely-in-the-canal hearing aids are molded to fit inside your ear canal. They are smaller than both ITC and ITE hearing aids. They are ideal for the improvement of mild to moderate hearing loss in adults. Because they are small enough to fit inside the ear canal, CIC hearing aids are the one of the most discrete options available in custom hearing aids. CIC hearing aids are very easy to use with a telephone. Wind noise is nearly eliminated. Sound clarity may also be improved because the sound is delivered closer to the ear drum than with an ITE or ITC. As they are the smallest custom hearing aids, popular features are not available. They are too tiny for volume controls or directional microphones. Some may have a program button, depending on the size of the ear canal. 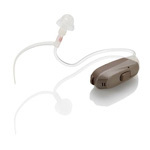 CIC hearing aids use the smallest hearing aid battery available. Also, they are not ideal for people with arthritis or other dexterity or vision impairments, as the shells and batteries are very small. Standard hearing aids have three major components. The first is the hard-molded plastic case that sits behind the ear and contains most of the components of the hearing aid. The second is called a coupler and it’s the piece that fits inside the ear and can be either a standard dome or a custom hearing aid ear mold. The third is either a tube or a wire that connects the case with the coupler and allows for the sound that’s processed in the case to be sent to the ear. Traditional Behind-the-Ear (BTE) – For mild to profound hearing losses. Behind-the-ear hearing aids hook over the top of your ear and rest behind the ear. The hearing aid picks up sound, amplifies it and carries the amplified sound to a custom made ear mold that fits inside your ear canal. The ear mold is connected to the instrument by using standard gauge tubing. These instruments are generally visible in and behind the ear. This type of aid is appropriate for almost all types of hearing loss and for people of all ages. The real advantage to BTE instruments, especially Power BTE aids, is their general durability. Most of these hearing aids are designed specifically for pediatric use or other applications that require protection from exposure to the elements. Common features include GORE-TEX membranes inside the shell to protect the electronics from moisture and specially designed microphone guards that keep dust and other debris out of the microphones. Receiver-in-the-Canal/Receiver-in-the-Ear (RIC/RITE) – For mild to severe hearing losses. At a first glance, these devices are similar to the BTE aid. There is however one crucial difference: The speaker (‘receiver’) of the hearing aid is placed inside the ear canal of the user and thin electrical wires replace the acoustic tube of the BTE aid. There are some advantages with this approach, the first being that the sound of the hearing aid is arguably smoother than that of a traditional BTE hearing aid. With a traditional BTE hearing aid, the amplified signal is directed to the ear canal through an acoustic tube, which creates a peaky frequency response and a high-frequency distortion pattern. With a RIC hearing aid, the speaker (receiver) is inside the ear canal and the amplified output of the hearing aid does not need to be pushed through an acoustic tube to get there, eliminating the high-frequency distortion. 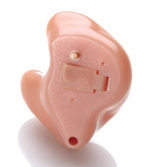 A second advantage is that the case of a RIC hearing aid can typically be very small and the wire connecting the hearing aid and the speaker is extremely inconspicuous. When compared to both traditional BTE and custom products, the size and visibility differences are quite noticeable. 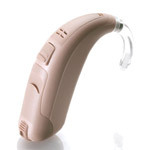 For the majority of people, this is one of the most cosmetically acceptable hearing device types. Thirdly, RIC devices are “open fit” technology so they can be fitted without plugging up the ear, offering relief from a sensation called occlusion. Occlusion happens when a hearing aid or custom earmold fills the outer portion of the ear canal and the person wearing it perceives their own voice to be hollow or booming, sometimes to the point of intolerability. Because a RIC does not fill the ear canal and leaves a portion of it open, occlusion can often be greatly reduced or even eliminated. Open-Fit/Slim-Tube (OPEN) – For mild to moderate hearing losses. These are very small behind-the-ear-style devices, similar to RIC devices. The speaker remains in the case behind the ear and sound travels from the instrument through a small tube to a tiny dome in the ear canal. Because the tube is smaller than a traditional BTE, the amount of amplification available in an OPEN device is not as strong. These aids are best for mild to moderate high-frequency losses where low-frequency hearing is still normal or near normal. As with a RIC device, OPEN style hearing aids are cosmetically more appealing. The cases and tubes can be extremely small and discrete. OPEN devices also employ the same open fit technology that allows the majority of the ear canal to remain open, reducing occlusion.